You'll receive this quest from Wirtan just inside the Temple of Eothas in Gilded Vale (#1). Wirtan will tell you that Lord Raedric murdered the priests of the temple, and that their bodies are still in inside, probably on the lowest level. He'll then ask you to help him give the priests a proper burial, but he'll warn you that spiders and other creatures might have moved into the temple while it was sealed off. You'll have to do some fighting to reach the bodies (#9), including against spiders, skuldrs, shadows, and phantoms. If you're playing on the normal difficulty, then you should be able to survive the battles using Eder and Aloth (who can be recruited in Gilded Vale). On hard, you might need to wait for more help. You'll also have to deal with a pair of locked doors. For the first door (#5), you can open it by picking its lock, detecting its key (#3), or by ringing the bells next to it in the right order. There are a couple of clues for the bells. If you read the Initiate's Note (#2), then you'll learn that the middle bell should be rung second. During a vision (#4), you'll learn that the right bell should be rung first and last. From there it shouldn't take too many tries to figure out that the correct sequence is right, middle, left, right. For the second door (#8), you'll either have to pick its lock or use its key. 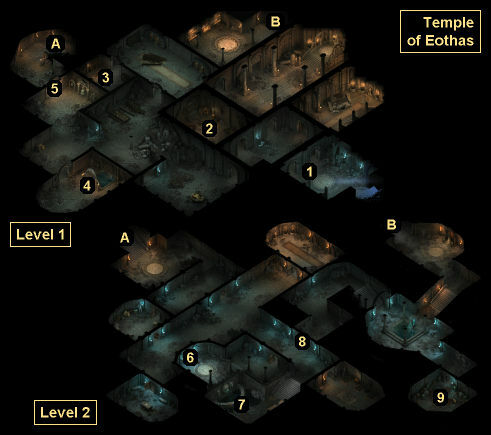 The key can be found in a flooded bath chamber (#7). To drain the chamber, you'll just need to turn the valve in the room to the north of it (#6). When you reach the final vault (#9), you'll be able to read the soul of one of the dead priests there -- and you'll learn that Wirtan was supposed to free the priests but that instead he left them to die. After completing the vision, you should pick up the Dead Priests' Bones. You can hand over the bones to Magistrate Urgeat in Gilded Vale (next to the hanging tree), and tell him about Wirtan. This will earn you a "moderate" reputation bonus with Gilded Vale, and Urgeat will give you 200 cp. You can hand over the bones to Wirtan, taking the benevolent or aggressive dialogue option. This will earn you a "moderate" reputation bonus with Gilded Vale, but Wirtan won't give you anything. You can hand over the bones to Wirtan without judging him. This will earn you a "moderate" reputation bonus with Gilded Vale, and Wirtan will give you 200 cp. You can kill Wirtan. This will earn you a "minor" reputation penalty with Gilded Vale, but Wirtan will drop the 200 cp reward money, and he'll have some other minor loot on him as well. Main stairs between Level 1 and Level 2. Back stairs between Level 1 and Level 2.